Are you looking for a longer 3 wood off the tee or have trouble controlling your driver? 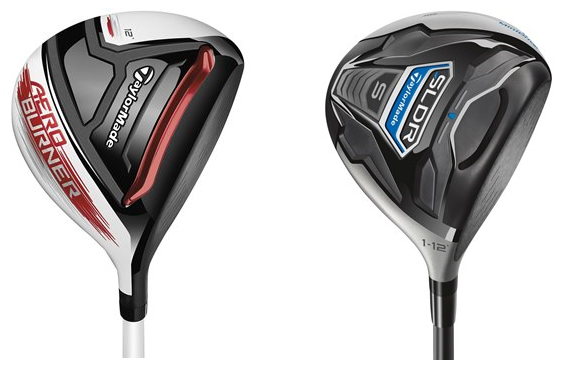 If yes to either, then TaylorMade SLDR Mini driver and the TaylorMade AeroBurner Mini driver are clubs you should be looking at. If you’d like a full recap of the TaylorMade SLDR Mini driver, you should check out this article. But, just know that you’ve come to the right spot if you’re looking to cure your driver woes. As for the TaylorMade AeroBurner Mini driver, it’s designed with 253cc clubhead and a 43.5” shaft to provide even more speed and forgiveness than the SLDR Mini. The AeroBurner Mini has been produced with the same goal as the rest of the AeroBurner metalwoods and is “Made of Speed”. Engineers have taken the AeroBurner Mini Driver to the next level by using what they learned from the SLDR Mini. They have designed a new aerodynamic shape, shallow face, raised center crown and implemented a new hosel fin, all combining to promote maximum clubhead speed during the downswing. The AeroBurner Mini also has a low-forward center of gravity position, which delivers driver-like launch conditions but with amazing accuracy. Another feature, found alongside the AeroBurner metalwood line, is the biggest open channel Speed Pocket of any TaylorMade metalwood. The advantage with this is an increased size of sweet spot while reducing spin, which equals more distance and forgiveness. A larger, hittable face area and decreased overall size promote improved playability in a confidence-inspiring shape. As you can tell, when you improve something it’s naturally going to produce better results. However if you find a good price on a TaylorMade SLDR Mini driver, you won’t be disappointed. Do you need help with you golf game? We’re here to provide you with the expert advice of PGA Professionals 24/7. They’re here for you – go ahead and call them “Your Pro”! ‹ How Much Bounce Do I Need On My Wedge?